These Bright Red Table Skirts are Only Part of the Massive Collection! Other Linens and Throws Feature Custom Printing for Increasing Brand Recognition! 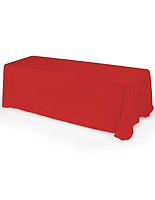 Purchase Printed or Plain Table Skirts Now and Save with Low Prices! 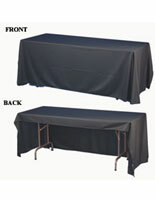 Table drapes easily cover (3) sides of 8' x 30" x 30" table. Polyester fabric is flame retardant & includes certificate. Table covers hang down 6" on the back side of table. 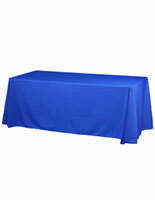 Table throws, linens, and other table skirts are made from polyester fabric that is machine washable and dryable. This fabrication makes it quite easy to clean yourself. 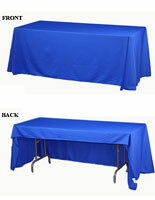 These table skirts are fire retardant and include a certificate from an independent testing laboratory. Trade show covers are sewn with rounded front corners, and the fabric falls 2" above the floor when properly aligned. 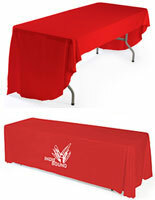 Cover a worn down table with these table skirts to develop a professional appearance at you next event! 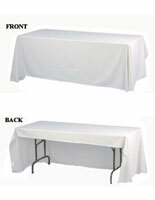 These tablecloths, table skirts feature a design that covers an 8' x 30" x 30" table on three sides. This economical design allows you to save money when compared to standard models without using a lesser quality fabric. 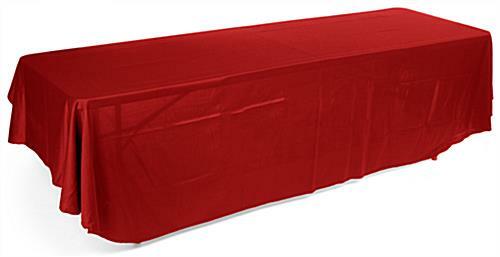 These table skirts are perfect for use at a trade show or job fair, where they present a professional appearance and leave room behind the table for people to sit. 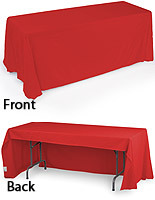 Tablecloths come in a striking red color that easily garners attention in any location. Combine the table skirts with a table runner that has a custom design to really grab passersby's interest!